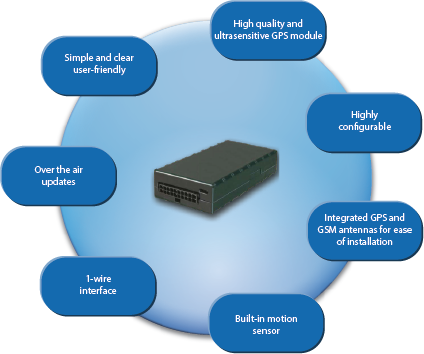 ♦ An AVL device per vehicle with GSM and high powered GPS antennas in a small case. The wiring and maintenance operations are reduced to their simplest expression. Once installed and concealed in the vehicle, it can transmit data to GloboConnect platform in real time. ♦ A GPRS SIM card per AVL device with the subscription for all communications. ♦ The data hosting on secure servers. → A rental offer “all inclusive”. → A purchase offer for the hardware equipment and a monthly service fee. ♦ Connection fees, configuration and the hardware parameter adjustment. ♦ Follow up the proper functioning of the AVL device during the time of the subscription. – Permanent access via a user name and a password from any PC connected to the Internet for the geographic tracking of your vehicles. – On any computer, each authorized user of the company accesses securely the data he needs to control the action. – In order not to overload the platform, these reports are generated and transmitted from an autonomous server. – They will be transmitted to your convenience (type of reports, time …) to your email box. Training your employees to the subscribed platform.